II. Psalm 90 - read 1-6, 12 first; then, 16-17. 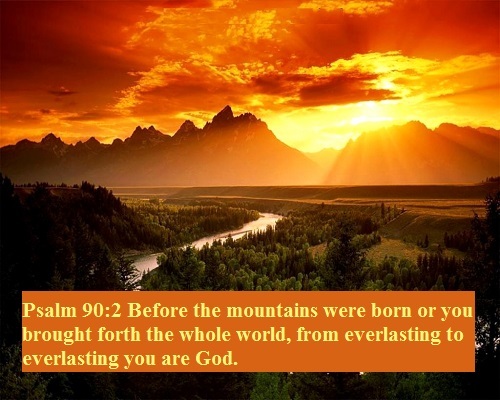 2 Before the mountains were born, before you birthed the earth and the inhabited world - from forever in the past to forever in the future, you are God. A. What does it mean to count our days? To what end? B. In the second set of verses, we get an echo of an important lesson we learned last week. What meaning do you find here? What do we hope will be the impact of our deeds? For those of you who have read Ecclesiastes, how does the psalmist here challenge some of its main ideas? Our actions are important reflections of our commitment to God. We hope they are reflections of the sweetness of God’s direction to us. Further, we know that our actions have consequences for others. When we live in God’s ways, others take notice and, we hope, are drawn to service of God, too. This is especially important for those in our domain, our children as well as those with whom we work. Even more important perhaps is the impact of what we do on the children in our world, and their children, and so forth. We hope our work is “firmly found,” that is, as enduring as that which sustains buildings, even dynasties. Or, put another way, we hope our handiwork is like a fruitful tree, bearing sweetness from God well into the future. III. Psalm 104 - read 1-4 first; then, 9-12. 1 Let my whole being bless the Lord! Lord my God my God, how fantastic you are! You are clothed in glory and grandeur! 2 You wear light like a robe; you open the skies like a curtain. 3 You build your lofty house on the waters; you make the clouds your chariot, going around on the wings of the wind. 4 You make the winds your messengers; you make fire and flame your ministers. 9 You set a boundary they cannot cross so they’ll never again cover the earth. 11 providing water for every wild animal - the wild donkeys quench their thirst. 12 Overhead, the birds in the sky make their home, chirping loudly in the trees. A. God is clad in light. What does that mean? (While God is invisible, God is clad in glory and is overwhelmingly present. As light denotes, God is enlightened, beckoning, showing the way, true. B. God walks on the winds and makes messengers of them. What does that mean? C. What does the image of fire convey? D. We see the image of water once again in the latter verses. What do we now see it means? E. What do you make of the animals, and the birds, specifically? (We’re certainly reminded of the birds that nest in the Temple stones in an earlier psalm. We may think, too, of the choristers who sing in worship, in sacred space, with God. Since these images of birds are representative of us, we think of us in all these poetic descriptions of creatures that “make their homes” and “sing” in the glorious world that God has created. IV. Psalm 133 - read the whole psalm. 1 Look at how good and pleasing it is when families live together as one! Aaron’s beard! - which extended over the collar of his robes. 3 It is like the dew on Mount Hermon streaming down onto the mountains of Zion, because it is there that the Lord has commanded the blessing: everlasting life. A. Verse 1 is a key part of the liturgy in Jewish worship. What is its core meaning? What does it have to do with the objective of living near to God? Can you see the relationship of this idea to the commandments Jesus identifies as great? Discuss. 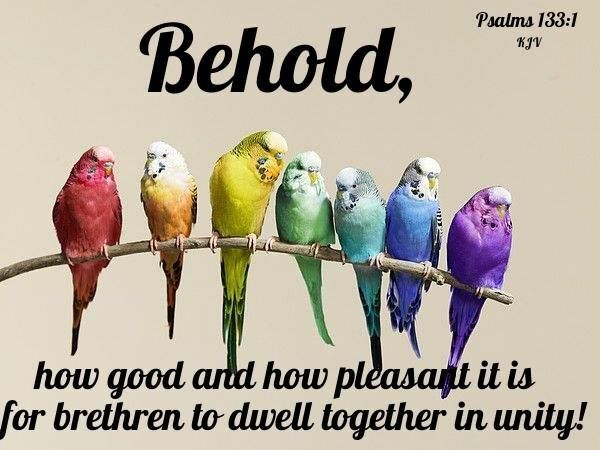 (God wants us to dwell with others in unity. When we do, I would suggest, it’s like we’re dwelling with God. Let’s always remember the inter-relationship of the commandments Jesus cites as the great commandments. We love God, and we love our neighbors as ourselves. In that flow of love from us to God and God to us, from us to ourselves and us to our neighbors - God is present. B. When we read of the pouring oil and the falling dew, we should remember these images from our Bible study. What’s their significance to the main idea of this psalm. (They speak of symbols of our love and service of God. The oil pouring down brings to mind the anointment of priest and king, their initiation into service of God and people. The dew is a manifestation of water from heaven on the earth. We just saw that idea in the last psalm we examined. We’re reminded of Moses’ teaching of dew and rain in his final oration as a way of talking about God’s teachings and how we can absorb them. God calls us to service, and we serve out of love for God. God nourishes and directs us. We love our fellows and live with them in harmony. As the poetess Pamela Greenberg suggests, this is where God willed into existence the blessing of eternal life. 12 But you, Lord, rule forever! Your fame lasts from one generation to the next! What’s the main idea of these verses? How do they inform our study of the importance in Psalms of the notion of nearness to God? (1. Even a person who suffers greatly, perhaps feeling chastised by God, maybe dying, thinks and writes thoughts of God’s enduring sovereignty. Further, this person shows a respect, even reverence, for remembrance - a memory of God’s deeds, God’s miracles, God’s love, and God’s saving hand. It’s as if the simple acts of memory and recitation revive, or at least begin to revive, hope and to sustain the supplicant. All of this is crucial to maintaining faith, hope in our restoration, and a sense of being favored with living in God’s presence. This idea of “from generation to generation” gives our faith a firm place, that is, that it is lasting, and that regardless of our straying or separation in the past or even the now, there is hope of lasting presence and deliverance. 2. We see the psalmist recording these thoughts in the hope that memory is facilitated, deed is done, and the presence is felt, not only now, but, crucially, well into the future. The sense that God is forever and ever is comforting, especially in the assurance of abiding presence for each generation, ours and all that follow. 3. The idea that our children will be settled and their children will be established before You gives again an enduring and ongoing nature to the quality that fits underneath God’s eternal presence. There’s security that spans time in the presence. What are the main one or two ideas that you will carry forward in life as a result of our study of Psalms?